"If you've gone as far as him, how do you challenge yourself?" Netflix has debuted an official trailer for the documentary Sky Ladder: The Art of Cai Guo-Qiang, profiling the life and work of Chinese artist Cai Guo-Qiang. As you will see in this trailer, his art is based around fireworks and explosives, and he was hired to arrange the fireworks at the opening and closing ceremonies of the 2008 Beijing Olympics. His latest project is an attempt to build a "sky ladder" out of fireworks, which this documentary covers in addition to examining his life and influences. "If you're Cai Guo-Qiang, you continue to chase the ambitious dream that has eluded you for 20 years—Sky Ladder—a 1,650 foot ladder of fire climbing into the skies, connecting heaven and earth." This doc might be worth seeing just for all the stunning footage of his fireworks. Enjoy. Cai Guo-Qiang's work spans East & West, human & cosmic, the playful & the profound. His signature gunpowder paintings pay homage to the Chinese roots of the explosive medium, while incorporating elements of chance and unpredictability. His massive explosion events actively engage audiences around the globe—from his seminal 1993 work that extended the Great Wall of China with six miles of gunpowder fuse; to the daytime colored fireworks that ripped through the deserts of Doha, to the astonishing opening and closing ceremonies of the 2008 Beijing Olympics. Told through the artist's own words and those of family, friends, colleagues, and critics, Sky Ladder traces Cai's meteoric rise from childhood in Mao's China to pre-eminent global artist. We witness as Cai struggles with how to affect social change through art, and navigate the compromises and complexities that arise when you’ve made it to the top. When you’ve gone as far as he has, how do you challenge yourself? Sky Ladder is directed by Kevin Macdonald (Touching the Void, State of Play, Life in a Day, Black Sea, Marley). This originally premiered at Sundance. 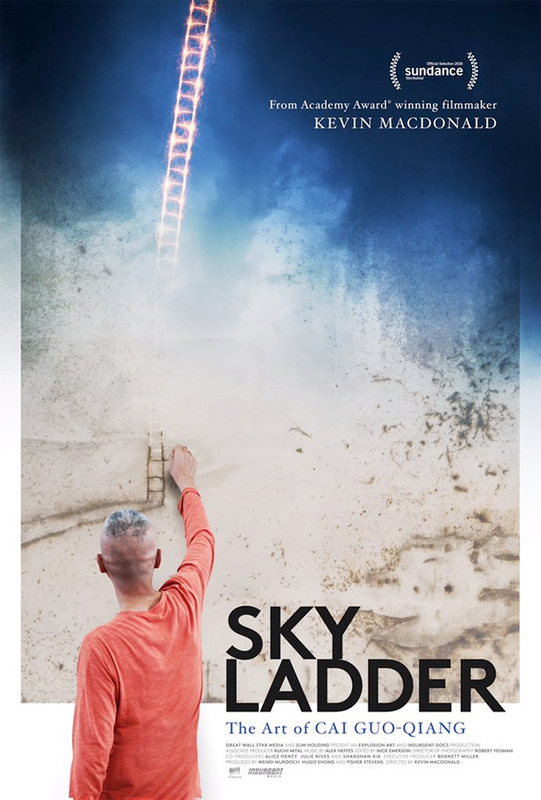 Netflix will release the Sky Ladder documentary in select theaters starting October 14th this fall. Curious? Love the almost generative firework burns on the canvas. Looks good. Perfect form for modern art. Too many times people have been fooled into this an acrylic box is art. Cai's art requires immense skill and practice.